iPower is the leading manufacturer of grow light systems; supplying gardeners, worldwide, for over a decade. We use the transformative power of light to make gardening more efficient and productive. In addition to HPS/MH and Ceramic MH technology, we offer digital ballasts, fluorescent, and LED lighting systems. From hobbyist to commercial applications, we offer a broad spectrum of gardening tools and equipment in hydroponics, irrigation, climate control, and structures to help your garden thrive. iPower Ventilation Ducting is made from high quality aluminum to provide flexibility and protect against breaking during installation. Not only does the duct act as in intake and exhaust piping for active-cooled fixtures and reflectors, but also stores and dissipates heat at a steady rate, which reduces room temperature fluctuations. This 6-inch ducting fits any standard 6-inch inline fan. 3-layer thickness: Aluminum Foil + PET + Aluminum Foil. Helically shaped and internally crimped galvanized steel strip. Interlocking steel strips to form an air tight and leak proof system. Each ducting unit includes a pair of metal clamps made from stainless steel. This air duct is easy to cut using a pair of metal snips or a standard wire cutter. 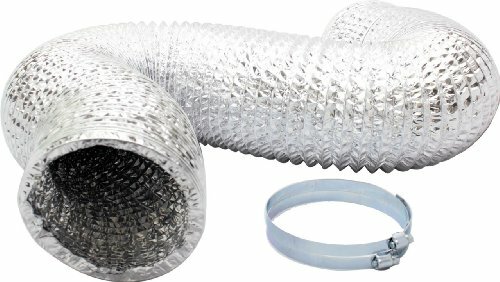 This ducting is easy to bend to install in hard to reach spaces such as grow rooms, attics, crawl spaces, etc. This ducting is made with aluminum reinforced with a spiral-wire, designed to prevent the ducting from unraveling when cut into smaller pieces. Typical applications for ventilation ducting include: dryer room vents, A/C or Heater ducting, grow room ventilation and other indoor gardening applications.